Refreshing, nature-scented bath soaks for the person who likes wielding axes as much as blissful relaxes. After a day of foraging or chopping fire wood, you like the idea of smelling like nature. But more like refreshing pine needle and citrus grove nature, not sticky, dirt-caked nature. These soaks get you. Add some Trail Soak to your tub, and come out wearing the subtle scent of spearmint, eucalyptus, and orange. 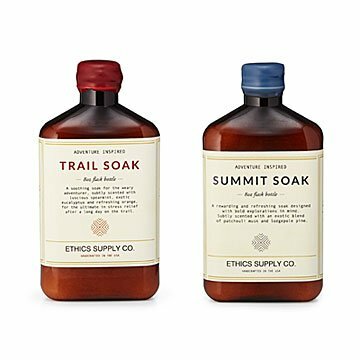 Or, go a little earthier with the Summit Soak, a blend of pine, fern, and cedar. It's a thoughtful gift for the person who likes wielding axes as much as blissful relaxes. Created by Laura Reid. Made in California.